Stratus is derived from a Latin word, sterner, meaning to lay flat. So, stratus is a horizontal cloud strewn (also from sterner) over the surface of the Earth. Stratify—to arrange in layers—is from the same root. Winter is stratus time. 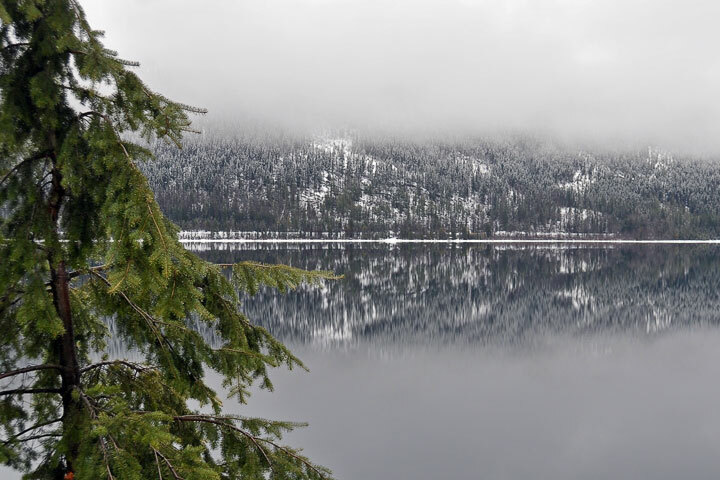 Above the cloud, the snow–covered mountains pierce a cerulean sky; below the cloud, the ceiling is grey and the walls steel blue; within the cloud, all is fog. 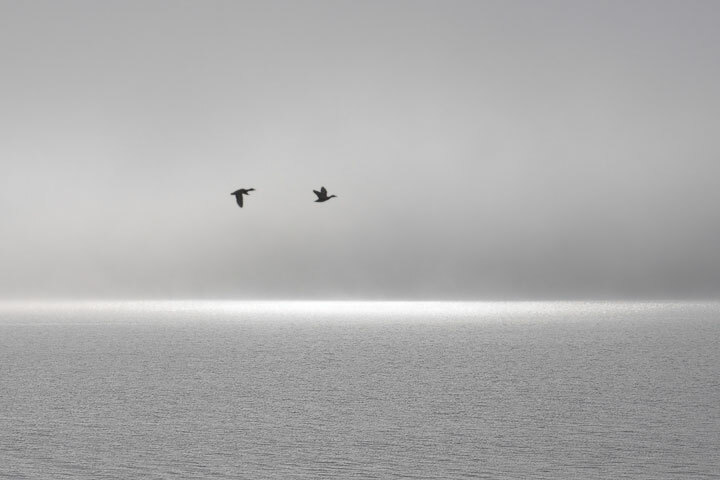 This is not to say that life along the Lake in the winter is an unbroken vista of stratus, but on those occasions that higher clouds are absent, the long nights, short days, and low Sun lead to a net radiative loss. The air on the mountain sides cools, drains down the slopes, and pools in the valleys. 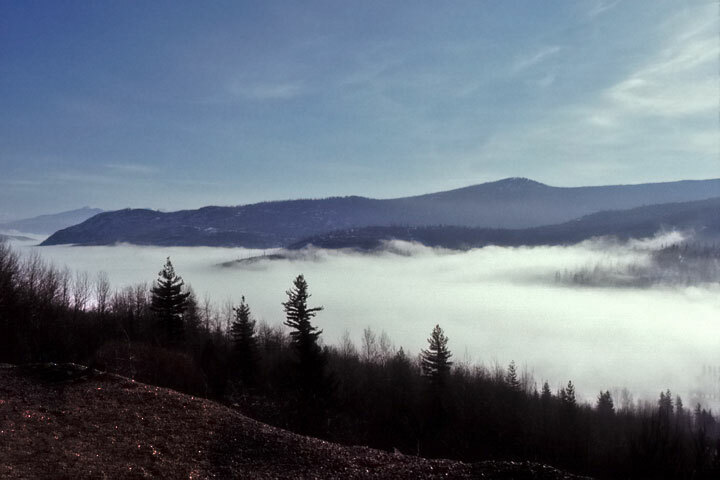 With further radiative losses, its vapour cools enough to condense and fill the valleys with fog. Cloud or fog A fog is a cloud which touches the surface. 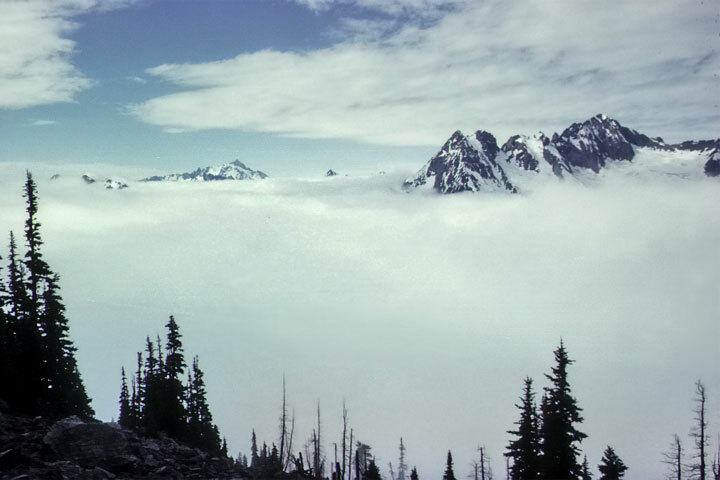 A person looking from valley bottom will see the stratus overhead as a cloud; a person farther up the mountainside may be enveloped in a fog. Once a fog forms, two things happen. The radiative loss from the fog is greater than that from the (previously) clear air, so cooling is accelerated and the fog thickens. Wind–driven turbulence mixes the cloudy air with the drier air above it. Curiously, although this infusion of dryer air dissipates some of the fog, it does so at the base—down at the valley bottom, not at the top where the mixing takes place. Any well mixed layer with cloud in it has the cloud at the top and the clear air at the bottom. The result is that the fog lifts to form a cloud—the stratus which so characterizes our winter. 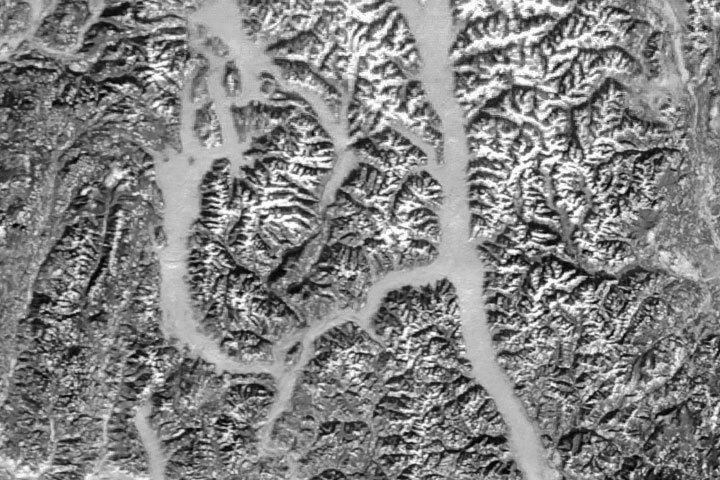 There is an additional mechanism which gives rise to stratus in the valleys, but it does not produce great uniformity. Rather, the stratus seems to hang along the mountain side or sometimes out in the middle of the valley leaving adjacent area clear. When it has been raining, evapouration of the raindrops raises the humidity near the valley bottom to close to 100%. Then all that is required to produce a cloud is modest ascent and adiabatic cooling does the rest. The winds in the valley are never perfectly horizontal. Sometimes there is a gentle flow against the valley walls and so there is lifting. Further, the valley is not of uniform width. Where the valley narrows, air flow along the valley will be squeezed horizontally and so rise; where the valley widens, air flow expands horizontally and so sinks. Where the air rises, the vapour rises, cools and condenses giving stratus. Pictures and time–lapse movies at the bottom of this page show this. 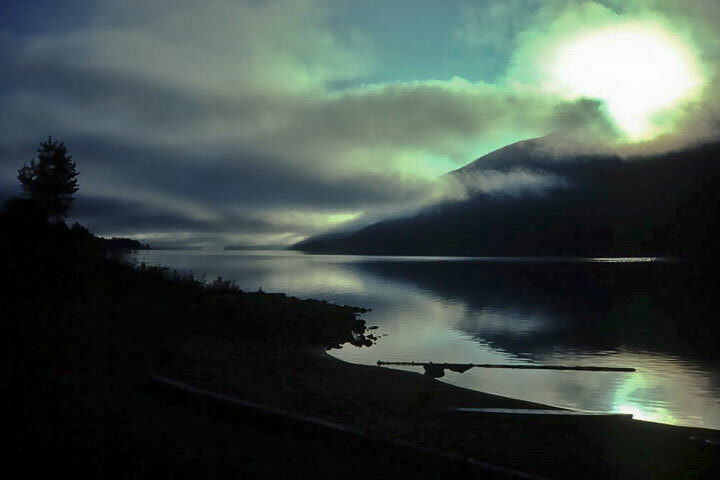 Valley stratus often starts as valley fog—the cloud extends to the surface of the water. But, when the drier air from above the fog mixes in to it, the fog lifts to become a stratus. Stratus This is a familiar view of stratus over the Lake. It is a fairly featureless low cloud of great horizontal extent. If one were on the mountain side and enveloped in it, the cloud would be seen as fog. In this picture, the cloud at the bottom is merely a reflection of the stratus above. So much warmer dryer air from above mixed into the fog, that while it began to lift to form a stratus, it also broke up. As seen from above, it isn’t possible to determine if the cloud reaches the valley bottom and so might be called a fog. 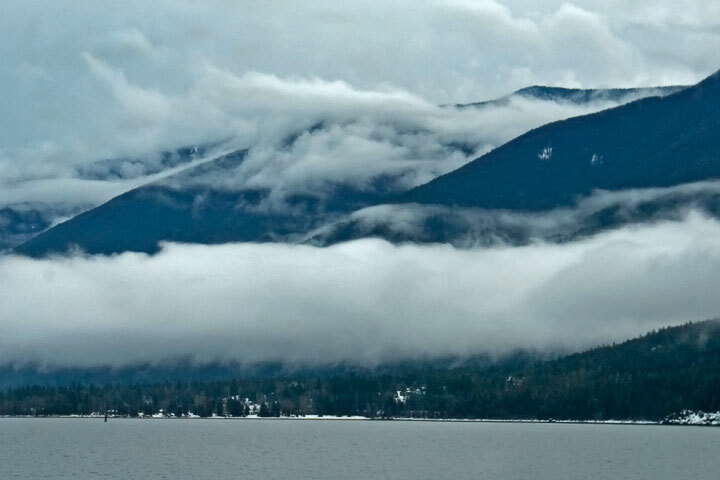 A late January view of stratus over Kootenay Lake. It is early November and the leaves add some colour to the grey scene. Valley Stratus A satellite picture of the West Kootenay showing stratus filling the valleys of Kootenay Lake (on the right) and the Lower Arrow Lake (on the left). Between them in the top half of the picture is stratus filling the valley of Slocan Lake. 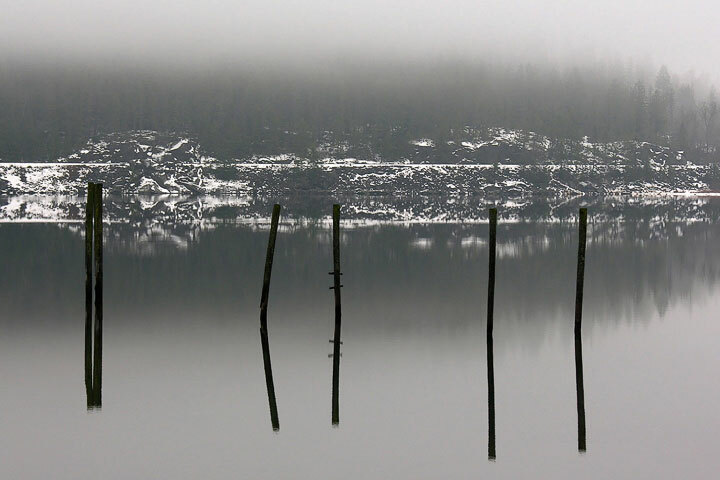 A typical winter scene, this image was captured on December 12, 2005. 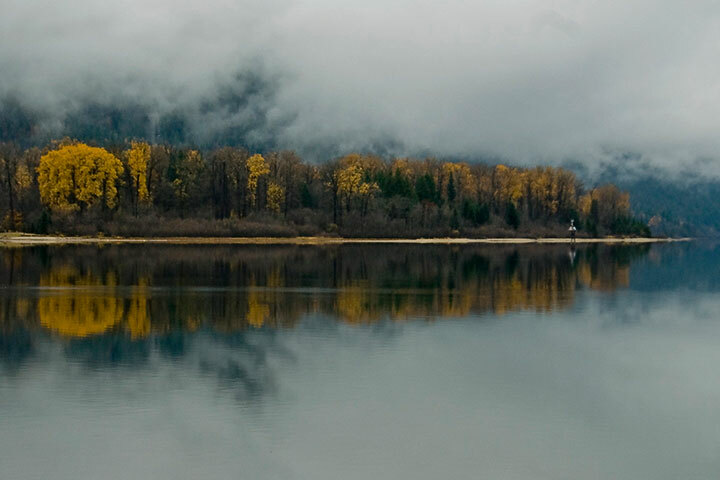 Valley Stratus produced by the lifting against the mountainside of the rain–soaked air.